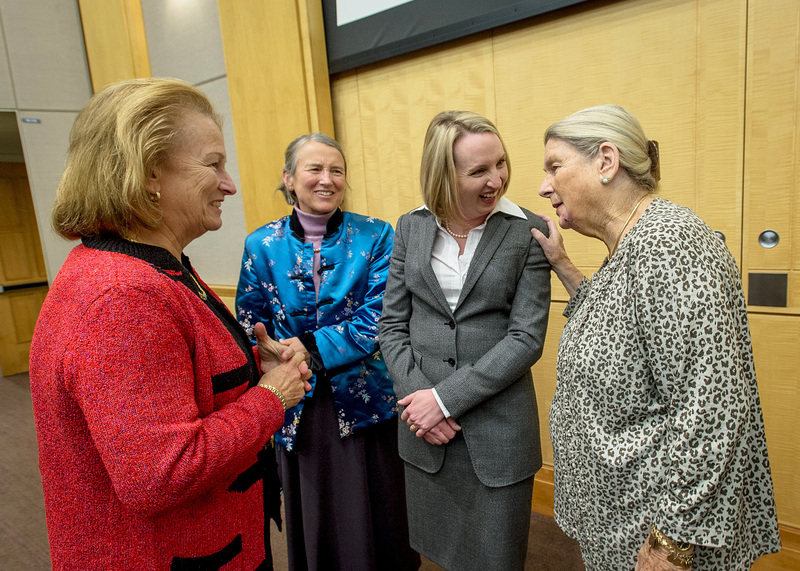 Joseph Murray’s daughters, Ginny and Katherine (at left), and his wife, Bobby (at right), chat with Elmi Muller. 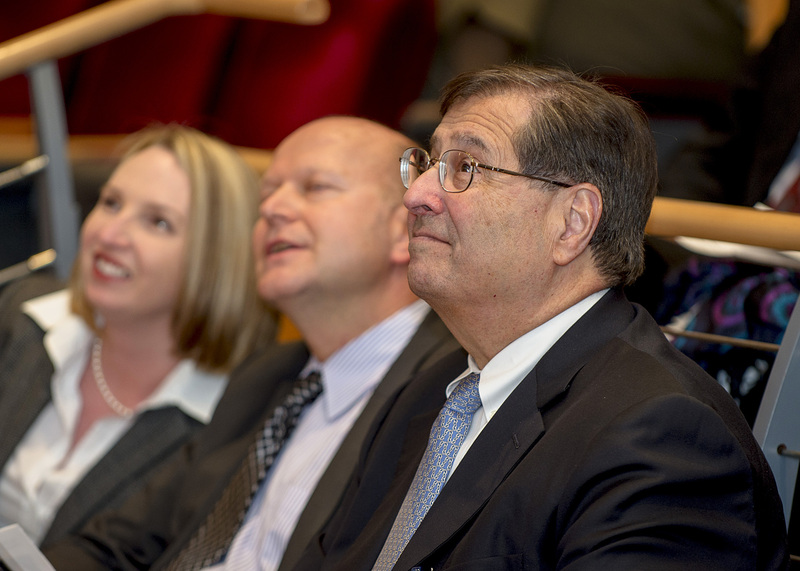 Last month marked the seventh annual Joseph Murray Visiting Professorship in Transplantation—the first such lecture since Murray’s passing last year. True to Murray’s focus on multidisciplinary collaboration, the lecture itself is made possible by a partnership among Transplant Surgery, Renal Medicine, Infectious Disease and the Center for Surgery and Public Health at BWH. This year, Elmi Muller, MD, head of Transplantation Services at Groote Schuur Hospital in Cape Town, South Africa, presented. Muller spoke about the risks and complexities of transplanting HIV-positive patients in South Africa. Prior to 2008, HIV-positive patients who were diagnosed with end-stage renal failure were not given dialysis nor considered candidates for transplant. “At that point, HIV-positive and renal failure equaled a death sentence, and those patients were sent home to die,” she said. The fear at the time was that these patients would use up limited resources for transplantation in the country, and that they would also experience high rates of rejection. “In South Africa, we can’t afford to provide dialysis for all patients—only a few people who are transplant candidates receive dialysis,” she said. Muller believed it was time for change. “We needed to do something to give hundreds of people hope, to help people with HIV and renal failure and give these people an opportunity,” she said. Her solution was transplanting HIV-positive patients with organs from deceased donors who were also HIV positive. Since 2008, 26 such patients have been transplanted. “Some people felt the risk I was taking would be too high—that the extra viral strain on these patients would be too much, and that opening up transplant and dialysis to HIV patients would become a huge issue in South Africa,” she said. But it turned out to be a step forward. The utilization of HIV-positive organs initiated by Muller has resulted in a change of legislation in the United States, where the use of those organs has been approved recently. Watch the presentation on BWHPikeNotes.org. Elmi Muller, MD, Stefan Tullius, MD, and Michael Zinner, MD, chair of the Department of Surgery.